Unknown date – Source Kenneth Sanderson – Dollarfield Brickworks (Managed by Alexander Brodie). 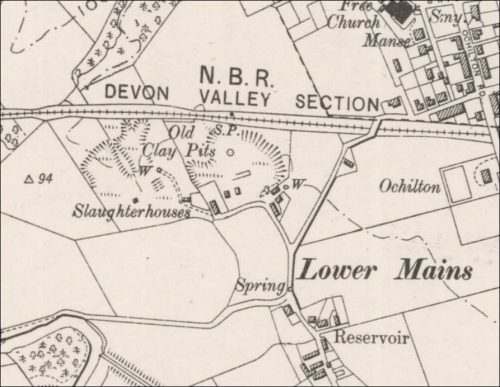 Dollarfield and Dollarmains brickworks were both started in 1882? and were adjacent to each other at Lower Mains, Dollar. 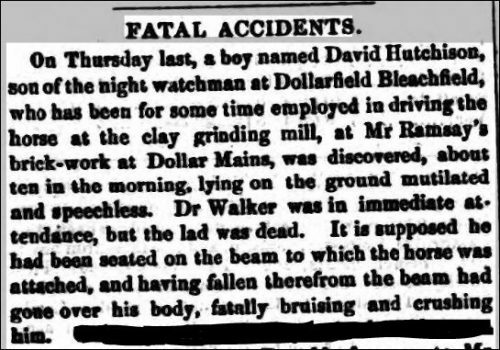 Below – 22/05/1858 – Alloa Advertiser – Fatal accident at Mr Ramsay’s brickworks at Dollar Mains. 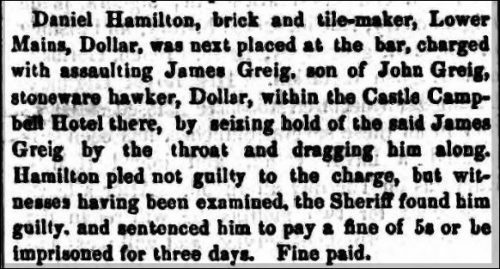 Below – 04/09/1858 – Alloa Advertiser – Daniel Hamilton, brick and tile maker, Lower Mains found guilty of assault. 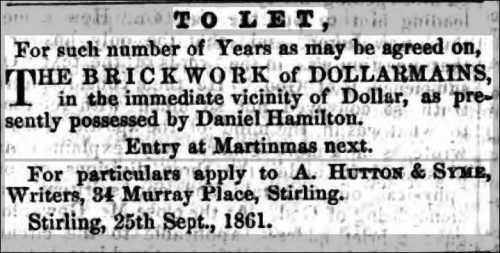 Below – 12/10/1861 – Alloa Advertiser – Brickworks at Dollarmains to let. Presently possessed by Daniel Hamilton. Below – 24/12/1864 – Alloa Advertiser – Dollar Mains brick and tile works. On Stock, superior common building bricks, fire bricks, agricultural drain pipes, and red and blue roofing tiles, also salt glazed sewerage and water pipes, feeding troughs, sink stones, jaw boxes, plain and ornamental chimney cans, vases, ridge and paving tiles, wall coping, circular and oval vent linings and flue covers. Every description of fire-clay goods made to any design. Prices may be learned on application to Mr Allan Ford, Manager of Works. 1867 – Jas Ramsay, Brickmaker, Dollarmains. 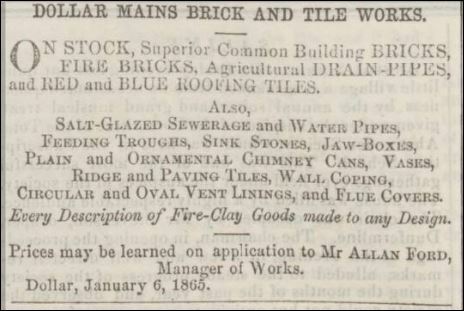 02/04/1870 – Alloa Advertiser – Offers wanted to produce common bricks, roofing tiles, drain pipes and pavement. Particulars to be had by applying to Mr Gillespie, Causewayhead. Dollar Mains Brick Work 24/03/1870. 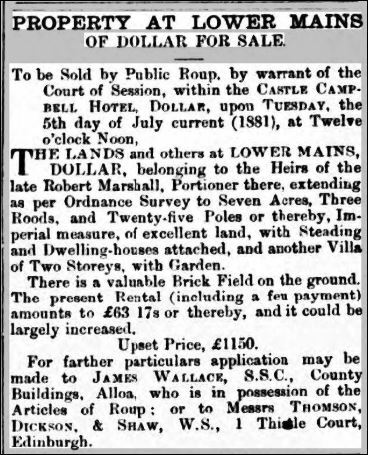 Below – 11/02/1871 – Alloa Advertiser – Bricks for sale – Mr George Young, auctioneer begs to intimate that he has received instructions to sell by public roup at Dollarmains Dollar on Saturday 18th Feb, about 70,000 bricks. Sale to commence at half past 4 pm. Dollar 09/02/1871. 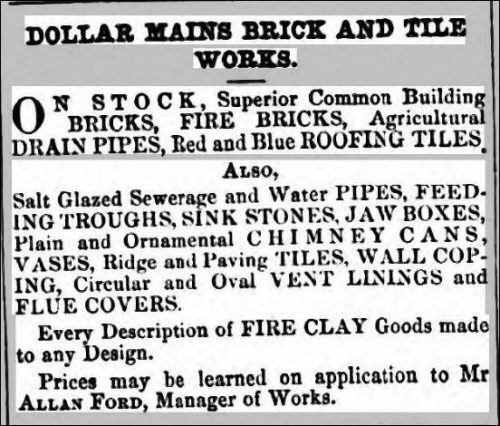 1878 – Allan Ford – Brick and Tile Makers, Dollar Mains, Clackmannanshire. 1878 – John Gillespie, Brick and Tile Maker, Dollar Mains, Dollar, Clackmannanshire. 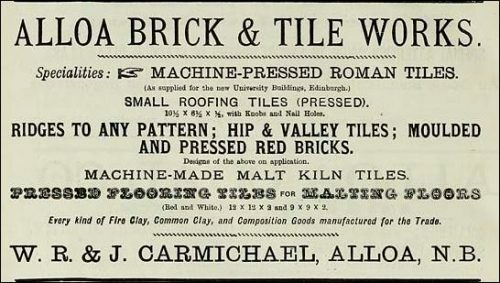 1886 – W.R & J Carmichael, Brick and tile makers, Dollar Mains, Office Alloa. 1886 – James Ramsay, Brick and tile makers, Dollar Mains. 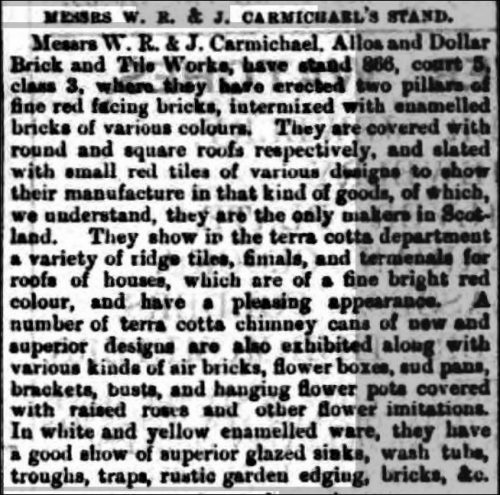 Below – 12/05/1888 – Alloa Advertiser – The Glasgow exhibition – Messrs W.R & J Carmichael, Alloa and Dollar brick and tile works, have stand 866, court 5, class 3, where they have erected two pillars of fine red facing bricks, intermixed with enamelled bricks of various colours. 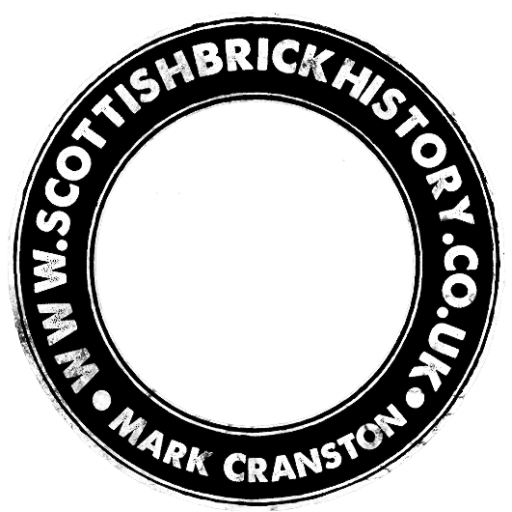 They are covered with round and square roofs respectively, and slated with small red tiles of various designs to show their manufacture in that kind of goods, of which, we understand, they are the only makers in Scotland. They show in the terracotta department a variety of ridge tiles, finials, and terminals for roofs of houses, which are of a fine bright red colour, and have a pleasing appearance. A number of terracotta chimney cans of new and superior designs are also exhibited along with various kinds of air bricks, flower boxes, seed pans, brackets, busts, and hanging flower pots covered with raised roses and other flower imitations. 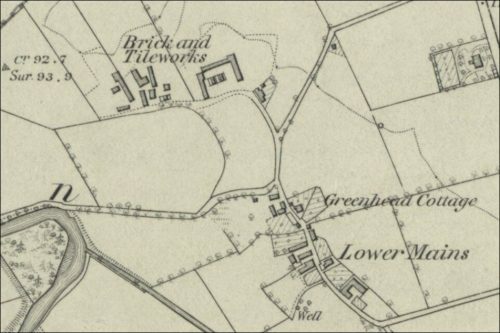 In white and yellow enamelled ware, they have a good show of superior glazed sinks, wash tubs, troughs, traps, rustic garden edging, bricks, &c.
Below – 1899 – Old Clay pits are marked and presumably mark the sites of the ex Dollarfield and Dollarmains brick works. Found at the McEwan Hall, Edinburgh. Alloa Brick & Tile Works, Craigward, Clackmannanshire. This brick was produced by W. R. & J Carmichael. Brick & Tile works of Alloa. Stamped Carmichael Alloa to both sides. . . .
22/03/1890 – Motherwell Times – Four labourers with no fixed abode, pleaded guilty to lodging in a brick kiln in Watsonville Brickworks in contravention of the Trespass Act and were dismissed with an admonition. 1896 – John Watson Limited – Watsonville Works, Motherwell. Office 123 Vincent Street, Glasgow.